It was a resounding Yes to repeal the offence. 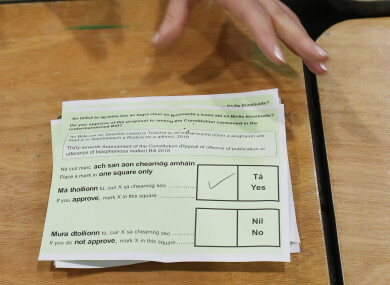 THE IRISH PEOPLE have passed a referendum to remove the offence of blasphemy from the Constitution. The publication or utterance of seditious or indecent matter is an offence which shall be punishable in accordance with law. The Oireachtas will also move to repeal Sections 36 and 37 of the Defamation Act 2009, introduced in 1999 over fears that the legislation at the time was not compatible with the Constitution. Those laws saw that a new offence of “publication or utterance of blasphemous matter” against any religion was added to the 2009 Defamation Act. All 40 constituencies voted in favour of the referendum. Turnout was 43.79%. A total of 515,808 people voted to retain the offence. See the full breakdown here. Email “The Irish people have voted to remove blasphemy offence from the Constitution ”. Feedback on “The Irish people have voted to remove blasphemy offence from the Constitution ”.